STARK COUNTY, Ohio — Federal, state and local police converged on a house in Carroll County. But, they weren’t looking for drugs, guns, or fugitives. 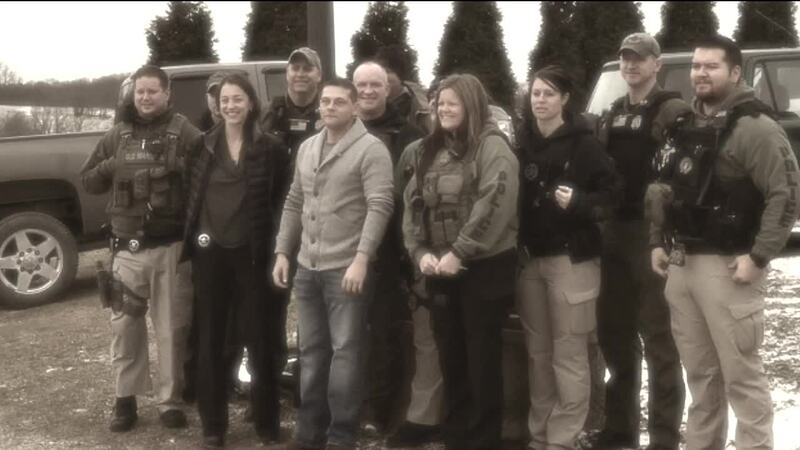 They were on a mission to help one of their own to help an officer they have never met. Detective Ken Edie, with the Houston Police Department, spent a decade patrolling the streets of Carroll County before heading west. “I knew Kenny very well,” said Officer Michael Middleton with the Northern Ohio Violent Fugitive Task Force. Middleton and his long-time friend would meet again but this time it was in a very difficult situation. Edie was just appointed to the Houston ATF Gun Crime Strike Force. He and other members of the task force were set to be sworn in on February 14 in Houston, but Edie was called home to Ohio. “Houston contacted us and said they had an officer whose father was dying. The officer was supposed to be sworn in but couldn’t be there because he would be in this area with his father,” said US Marshal Pete Elliott. Since Edie couldn’t be at the ceremony in Texas, US Marshals brought the ceremony to him. “It was very overwhelming to have it at my father’s house,” said Edie. Edie was sworn in with his dad by his side. “He couldn’t open his eyes, but I think he understood,” said Edie. His father, Greg Edie, died the next day. On Monday, members of the US Marshals Northern Ohio Violent Fugitive Task Force were honored by the Houston Police Department. “They did this from their hearts,” said Stark County Sheriff George Maier. The bond of police officers share stretched from Texas to Ohio and Ken Edie is extremely appreciative for the kindness and support. “It was bittersweet. I was excited for my career, but it was a bad, bad day,” said Edie.